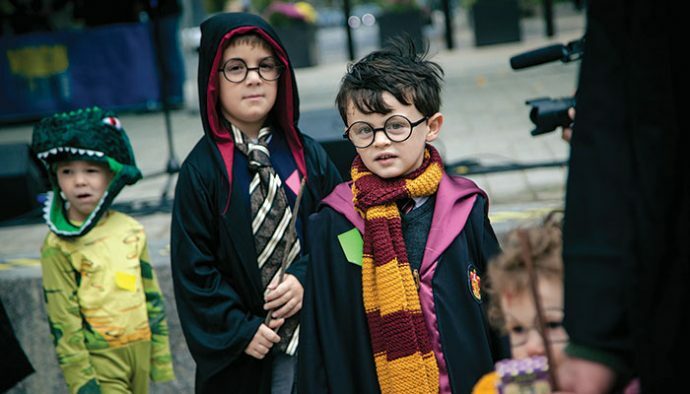 For one weekend each October, Ithaca’s downtown becomes all things Harry Potter. Streets close, merchants spring up on every corner, and thousands of fans flock to what has become one of the region’s premier attractions. This year’s Wizarding Weekend will take place Friday, October 27, through Sunday, October 29, on the Ithaca Commons. And if last year’s festival is any indication, attendees are in for a real treat. “I’ve read all the books, like, five times, and it still exceeded my expectations,” said Clare Duerr, age eleven, who traveled to last year’s event from Albany with her family. The idea for the festival began in the fall of 2015 with brothers Gabe and Aiden Gaydos, two local teenagers who were fans of the J.K. Rowling series. They devised a scheme for turning Press Bay Alley – a downtown retail complex created at The Ithaca Journal’s former storage bays – into Diagon Alley, an invisible street accessible only to the wizarding world. With the aid of local merchants, the project took off. Darlynne Overbaugh, proprietor of Life’s So Sweet Chocolates on Press Bay Alley, expected it would be an unassuming neighborhood affair and posted a plan on Facebook. It was originally conceived as a modest trick-or-treating event for a few hundred attendees. “I was never a fan of the scary side of Halloween,” Overbaugh confides. But her plan went viral and became a national sensation within days. MTV and Seventeen picked up the story. “I wanted Wizarding Weekend to be a festival where everyone gets to be a kid, even if you’re an adult,” said Overbaugh, who now serves as the festival’s director. With that credo in mind, she set about the task of organizing an assortment of family-friendly activities; a genuine carnival of delights for Harry Potter fans. As the word spread, she and the rest of the community began to brace themselves for an influx of people predicted to be in the thousands. They didn’t have much time to prepare for it. “The community rallied,” Overbaugh says with a smile. 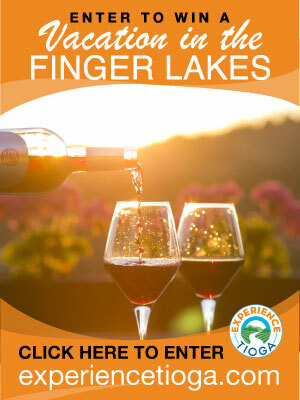 With the support of local organizations including the City of Ithaca, the Downtown Ithaca Alliance, and the Tompkins County Strategic Tourism Board, the Gaydos brothers’ fantastic festival quickly became a reality. More than 8,000 people attended Wizarding Weekend in 2015. Last year, the number grew to 10,000. This year, Overbaugh is expecting even larger crowds. “I’m guessing we’ll see between 12,000 and 14,000 attendees,” she says. Back this year are fan favorites like Wizard Chess, the Sorting Hat, and live owls from Cornell University’s Raptor Program. New events include a performance by the Binghamton Philharmonic on Saturday, October 28 at the State Theatre. Their selections include music from the Harry Potter films. Much like the young wizard who came into being from an idea J.K. Rowling scribbled on the back of a napkin, this upstate attraction has taken flight. Though it’s based on the bestselling books and subsequent movie franchise, Wizarding Weekend has a regional flavor all its own. Last October, visitors flocked to Press Bay Alley. At Life’s So Sweet Chocolates they picked up copies of the Daily Non-Profit, a clever take on the wizarding newspaper The Daily Prophet. It contained a map and a list of activities, including a wand-making demo in the basement of Ithaca Generator, a community makerspace in Press Bay Alley. Children and parents crowded the small subterranean space to catch a glimpse of a man in an apron standing behind a glass partition. As a wooden dowel spun atop a lathe, the man used a series of turning tools to shave away tiny pieces. A cloud of sawdust hung in the air as children jockeyed for position. Within moments, a drab length of broom handle was transformed into an enchanting baton. Meanwhile, in the parking lot behind Press Bay/Diagon Alley, hundreds gathered for the Quidditch matches schedule for that afternoon. Quidditch, a sport played astride flying brooms at Hogwarts, would at first seem difficult to simulate, but organizers had it covered. Boxy Bikes, a custom electric bike shop in Press Bay Alley, lent the players its self-propelled bikes – outfitted with brooms – which enabled them to glide about the parking lot as if adrift on a fleet of Nimbus 2000s. Two rival high schools battled it out for bragging rights beneath the autumn sunshine. The crowd cheered as talent from the local ESPN affiliate barked out commentary through a massive PA system. For more information on how to be part of something special, please visit wizardingweekend.com. 100% of all proceeds are donated to local charitable organizations. 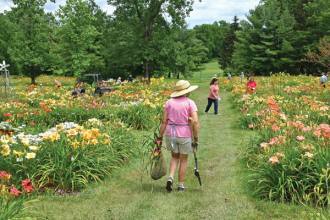 This year’s funds will benefit the Blue Sky Center for Learning in Spencer, New York. Half-Blood Prince Blood Drive with the American Red Cross at the Tompkins County Public Library. City of Magic Ball at the Community School of Music and Arts (ticketed event). Live music performances by Draco and the Malfoys, Cruciatus Curse, and Hawthorn and Holly. Street performers including Circus Culture and Hilby the Skinny German Juggling Boy. Themed games and crafts including the Wheel of Misfortune and Potions Making. Interactive displays and performers including the Wall of Portraits, the Sorting Hat, and the Magical Transportation Exhibit. Family-friendly activities including the Potions Crawl, Binghamton Zoomobile, and Physics Bus. Halloween Brunch at Hotel Ithaca (ticketed event). Binghamton Philharmonic at the State Theatre (ticketed event). Advanced Potions for Adults at Coltivare: An evening of spirits, wine, beer, and mixology (ticketed event). Live music performances by Snidget, IC Voicestream, and NEO Project. Street performers including CirqOvation, Hilby the Skinny German Juggling Boy, and Keith Engle. Family-friendly activities including Wand Dueling, Human Chess, and the Magical Artifact Hunt.